Is your dog’s anxiety wreaking havoc in your pack? Not only is anxiety terribly distressing for your dog but it often instigates destructive canine behaviours as well. Canine anxiety, in all its different forms, is one of the top dog problems I am contacted about. Whether the issue is separation anxiety, fear of other dogs, fear of travel, fear of storms, fear of new situations…. canine anxiety can be completely debilitating and have a huge impact on our lives and our dogs’ lives. Does your dog display anxiety symptoms? Common symptoms of anxiety include unwanted behaviours, fretting, excessive barking, trembling, whining, crying, hiding and shaking and drooling to name a few common symptoms. 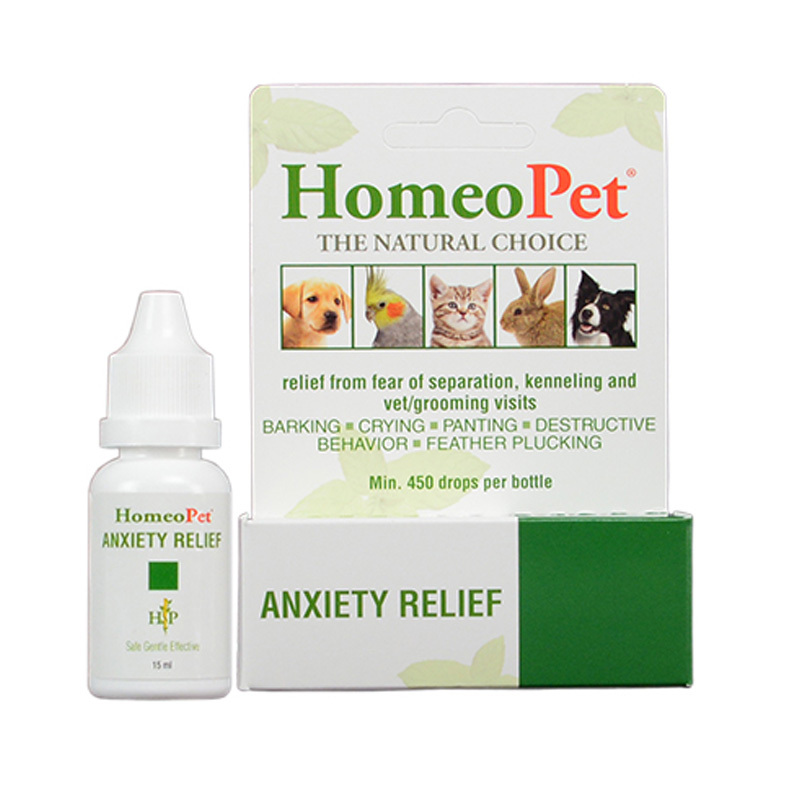 HomeoPet Anxiety Relief is a vet formulated remedy to promote a sense of calm for your dog. The formula has been clinically trialed and tested worldwide. A liquid solution, it has a very fast absorption rate and acts rapidly for acute conditions - often within 15 minutes. As a result you can help your dog quickly when situations arise. Unlike many prescription options HomeoPet Anxiety is non-sedating and non-habit forming. There are no side effects. This formula can be administered as required for fast actin relief, but correct dosing for particular conditions is important. Please read and follow the directions on the product packaging. 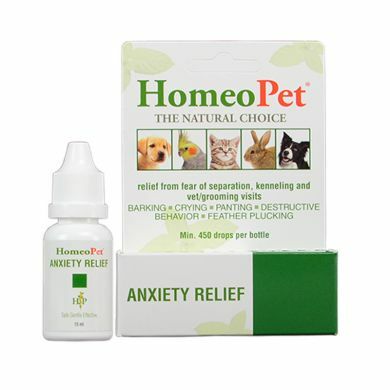 For travel anxiety you may wish to try HomeoPet Travel Anxiety which includes help for motion sickness. For fear of thunderstorms, wind and rain try the HomeoPet Storm Stress. German Chamomile (Chamomilla 6c & 30c) to promote a sense of calm in stressful situations. Valerian (Valeriana 6c & 30c) for cat or dog separation anxiety, introducing new animals. Borate of Sodium (Borax 6c & 30c) to relieve motion associated travel. St Ignatius Bean (Ignatia Amara 6c & 30c) for hysteria, grieving, emotional states. Meadow Saffron (Colchicum Autumnale 6c & 30c) for drooling, fear of travel, motion. White Hellebore (Veratrum Album 6c & 30c) for melancholy, fretting, sullen.